Wizz Air has announced network adjustment and market optimization plans of its Polish operations to reflect changing customer demand. On March 30, 2019, the airline will close its base in Poznan and add one Airbus A320 aircraft to its Gdansk fleet, allowing to launch four new services from the Pomeranian region. Wizz Air also announced that due to high customer demand it will convert its Warsaw fleet to an all-A321 fleet, adding two new routes and increasing capacity in the Polish capital, and also add one new service from Wroclaw to Kharkiv in Ukraine. Wizz Air has decided to adjust its Poznan network plan, close the base and take advantage of growth opportunities by reallocating the capacity to other Polish routes with higher demand effective from March 30, 2019. Wizz Air will continue to operate a number of its routes from Poznan, including the Paris-Beauvais, London-Luton, Eindhoven, Doncaster-Sheffield and Torp-Sandefjord services. All affected employees at the Poznan base will be offered opportunities elsewhere in the Wizz Air network. As a result of the optimization, 7 aircraft (Airbus A320) will be added to the Gdansk fleet, expanding the network with four exciting new routes connecting Gdansk with Kharkiv from October 28, 2018 and Oslo, Kutaisi and Bremen, from early April, as well as increasing the number of weekly flights on popular routes to Aberdeen, Lviv, Gothenburg and Kyiv. The new aircraft will also facilitate the creation of more than 30 additional direct jobs with the airline at the Gdansk base. The aircraft, which were allocated to Katowice and Warsaw for the 2018 peak summer season, will return to these bases for the coming 2019 summer season and remain part of the operations. In 2019, Wizz Air will have almost 10.5 million seats on sale on its low-fare routes from its eight Polish airports, which represents a 2.5% capacity growth year over year. Wizz Air’s first flight took off from Poland in May 2004 and since then, the airline has constantly expanded its operations carrying over 63 million passengers on its low-fare Polish routes. In the first eight months of 2018, over 6.3 million passengers flew with WIZZ to and from Poland, 19% more than in the same period of the previous year. Top Copyright Photo (all others by Wizz Air): Wizz Air (wizzair.com) (Hungary) Airbus A320-232 HA-LWF (msn 3562) BSL (Paul Bannwarth). Image: 943580. 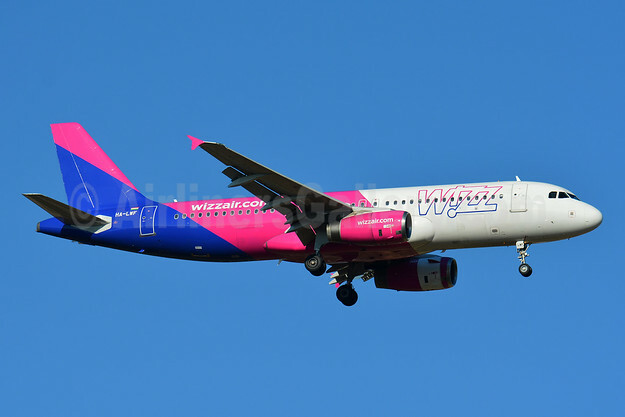 This entry was posted in Wizz Air (Hungary) and tagged Airbus A320-232, HA-LWF, msn 3562, Poland, Wizz Air, Wizz Air (wizzair.com) (Hungary) on September 20, 2018 by Bruce Drum.